Measure for required length from approximately 1" below the bottom of the rod to the floor, referring to the measuring diagram on this page. Tie length is not included in the final measurement, so length can be adjusted as needed. Choose your own style by creating bows or knots with your ties! 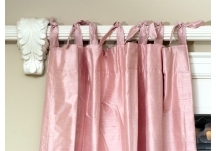 Custom tie drapes add a casual elegance to any room. Simple to install, our tie drapes are made with premium, durable reinforced professional stitching. 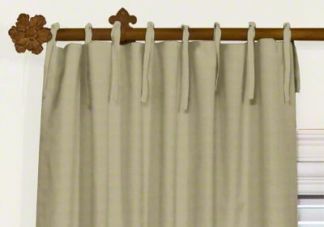 Because of the adjustable ties on this style, this drapery is perfect when length needs to be changed at installation. Ties are 12"L x 1/2"W for rods up to 2" in diameter. There are approximately 10 ties on each 48" panel, but the total number of ties will vary with wider panels. Tie drapes are recommended for use as stationary panels.